12th April 2019 from Alison in Swindon. Thank you so much for sending a msd east med navionics card so very quickly. 12th March 2019 from Bob James in the Wirral who ordered a 20kg Rocna anchor. Just wanted to say many thanks for the swift delivery of the Rocna anchor and also the book Happy Hooking which came the very next day. 10th March 2019 from Stephanie in Lousiana who ordered a pair of anti motion sickness glasses. That’s amazing, Andy! This order has been on quite a journey since November. Let’s hope the glasses actually cure my ‘car sickness’, an occupational hazard in wildlife conservation. Many thanks for being such a class act company with impeccable customer service kindness. Thanks, I got it! Looks great. Rob, I fitted the Merlin Smartgauge to my boat earlier this season after several charter clients experienced trouble keeping the service batteries charged. After several week's use, I have to say that I find it to be an excellent piece of kit. Its main benefit is that it provides clients with what amounts to a "fuel gauge" of the service battery bank's remaining useful capacity. You can see at a glance when the battery bank is fully charged, and what capacity remains when it's not fully charged. Much more meaningful to the average sailor than looking at a voltage reading (although it does also give a voltage reading!). It's now easy to keep the batteries in good shape - when the Smartgauge shows only 50% capacity left, charge the batteries! It's also very easy to fit. Unlike shunt-based battery meters, the Smartgauge has just three wires - to be connected directly to the battery terminals, via small fuses. There's no disturbance to existing cabling. It really couldn't be easier. I gather that its other key benefit is that it is self-calibrating, so it still gives meaningful data as the battery bank ages over the years. We'll see how that goes. All in all, it's a great addition to the boat's instrumentation, and it looks neat and tidy mounted at the nav station. 5 Stars Highly recommended. Fast response and very helpful. Thank you for letting me know. I appreciate your effort in being proactive in this matter. We can’t really do anything about typhoons interrupting shipping, can we? That is totally between God and the port of Hong Kong to sort out. Since the other grandparent who is involved in this purchase is a pastor perhaps I will ask him to intervene. Again, thank you for keeping me informed. On 25 Jul 2018, at 11:37, [email protected] wrote: Hi Graham, confirming we have received the C-Map you sent in and have changed the order to an update. Your card account was refunded and we will send the update for delivery tomorrow. Hi Andy, Just to let you know that the competition prize arrived yesterday exactly as DPD predicted. Thank you. I wanted to take the opportunity to congratulate Storrar Marine on their levels of customer service. I am on your mailing list having purchased a Blakes Seacock from you late last year. Your price was competitive and you also used DPD to deliver it which meant that I received it very quickly (I think it may have been the next day!). Online shopping is so often let down by poor delivery companies and the fact you use DPD is a major selling point in my opinion. They are the only company who always deliver exactly when they said they will to my address. To win a prize in your competition was a bonus on top of what was already a good experience. Your's will certainly be the first website I look at for marine items and I have already recommended you to others. Many thanks again. Hi Andy, I have just left a review about Trust Pilot on their website about the terrible reviews posted about that other website with an almost identical name as yourselves. I am shocked that this can happen. I have found your company 100% efficient and helpful to deal with. Hi Andy, Just to let you know the binoculars arrived safely. Excellent piece of kit. Hi Andy, my order has arrived in very good shape due to the perfect packing! The company Hempel seems to think that we Germans should pay 50% more for this stuff than for instance you British and so ordering it from you saved me a whacking €420 !!! Wow! Thank you very much. Regards, Max. Ok thanks. I’ve received the washing machine. 5th October 2017 from Vanir Tiscoski Jr in Barcelona who needed an Admiralty chart of the east Atlantic. Just to say that the seacock arrived promptly. Excellent service. Many thanks. 14th July 2017, from Stephen Ross in Peterhead who needed a C-Map update to a different chart area. 6th April 2017 from Stephen Lamb in Oslo, Norway, who ordered a Chart Art print. The ChartArt arrived and it's beautiful! Genuinely impressed by the quality and resolution of the print and the solid wooden frame. My expectations were exceeded. Bravo! Hey Andy, package arrived and all was well. Thank you for a very good package. 6th December 2016 from Tim Bendix, Alnwick who ordered a Barton "K" Cam Cleat. Hi, Andy, I just received my order. All is perfect and I am very happy. Thank you for your reactivity and your service. Congratulations to all your team. Eric. Thank you for your prompt service and information. I expect to sail in the morning from Cascais towards Lagos so will be there before it arrives, I will of course inform the marina to expect it. Really interested to read your latest info mail regarding Boarding Ring Glasses. Your experiences exactly match ours with Fiona using hers to counteract my boat handling as well as the often nasty wave and swell patterns...... I have tried to perfect the best 'Comfy Ride' helming technique to help crew through the rough stuff but sometimes the wind over tide, short intervals and adverse heading beat all the best intentions. Anyway, the Boarding Rings have been a staple part of F's anti seasickness armour for the past three years and very effective they have been. However, this year on our passage to Orkney F noticed that the 'ink' in the lenses had completely evaporated in one side piece and was significantly reduced in the remaining three. While still having some effectiveness the original direct effect was somewhat reduced. As a result we contacted the manufacturers by e-mail and had a superb response. Our new Best French Friend Hubert sent free replacement lenses by return post with handwritten details for application. He apologised for the problem and explained that a batch of the early lenses had been defective. Just a thought but might it be worth passing on the experience in case others have encountered the same issue? 13th July 2016 from Mike Benson in Barrow in Furness who ordered a small Navionics chart for his Lowrance Globalmap 3500 chartplotter. 30th June 2016 From Michael Norman in Whitby who purchased an outboard trolley. 9th May 2016 From Sherry in Cheltenham who ordered a chart art print. Just a quick email to say that I hadn’t opened the chart (I simply wrapped it and delivered it to my cousin for his birthday present) – it was absolutely brilliant – a superb job done by the guy who stitched 5 charts together. 9th April 2016 From Nick Walker in Bucks, who sent in some C-Map charts for updating. Many thanks for your very prompt action. Cartridges received yesterday. Excellent turn round. From Michele Keeves in York, who ordered some 3 Strand Nylon, a Wichard Chain Hook and a Stainless thimble which wasn't required, and refunded. Thank you, what a brilliant service, we shall certainly be using you again when the need arises. 26th January 2016 from Ashley Savage on the Jurassic Coast who was trying to buy a Musto Gore-Tex mid layer Blouson. May I thank you for the swift delivery of the replacement Goretex Musto Blouson Jacket in a size medium (the large proved far to baggy around the chest). Frustratingly the medium is too short in the body. I will return this to you tomorrow morning via next day delivery and would be grateful if you could process a refund. Frank Cockburn resides in Mitford, and Yacht is normally moored on the River Coquest, I purchased from Storrar Marine as I was provided with helpful and friendly information in the store, and then on price, a web site that was easy to use, and a Chandlery with a reputation for service to north east mariners. 21st Dec 2015 From Derek Manning in West Sussex who needed his Anti Seasickness Glasses replacing. 30th Sept 2015 From Stuart Spence in Co. Down who needed to update his Raymarine E series plotter to be able to view the current release of Navionics charts. Dear Andy, the software update compact flash card is enclosed. Thanks for sending me the update. I put it in the chartplotter on Saturday and it has worked a treat. 28th Sept 2015, From Charles Pybus in Maidenhead who found his bi-focal sunnies too powerful and exchanged them. Hi Charles, We received your glasses back and sent out replacements by 1st class post on Wednesday so I’m surprised you haven’t received them yet. Please can you confirm whether they have arrived. 4th August 2015 from David Hulston who is sailing from Spain to the Canaries. He ordered a C-Map MAX chart when it should have been NT+. Many thanks for pointing out I ordered the wrong model. Fantastic service. 27th July 2015 from Allen Brunton who had his mainsail in our sail loft for some repair work. Thanks Robbie, I will go and examine the "large inconvenient" parcel that is destroying tidiness of the customer space in the marina office, to see if, as I suspect, it is the offending item; in which case thanks for splendid service yet again. 21st July 2015 from Lucy Peel in Dartmouth who ordered a Seago Ranger 320Airdeck inflatable dinghy. Just a quick note to thank you for processing my order so efficiently. From responding to my initial enquiry to the point of receipt, your service was first class! 14th July 2015 from Sharon Seah in New York who orderd 4 x Whale Henderson Watertight Locker Doors. Hi Andy, It's just been delivered. Thanks for great service! 21st May 2015 From Helmut Klein whose boat is in Nice. He purchased a Seago Ranger inflatable, a Seago ISO liferaft and a Universal Cradle to stow it on the pushpit. 8th May 2015 From Clare Gallacher in Donegal who ordered some SeaJet Shogun Antifouling. Got the paint! Thanks for a great service, and all the follow-ups. 1st April 2015 from Nick Thwaites in Spain or the Canaries who bought 3 Marinet Mosquito nets for his hatches. Nets fitted, great service, everything happened perfectly. Why would anyone go anywhere else. 30 March 2015 From Mark somewhere in the Med. 29 March 2015 from Alastair Troup in Devon who sent us two C-Map cards for updating to a different area. 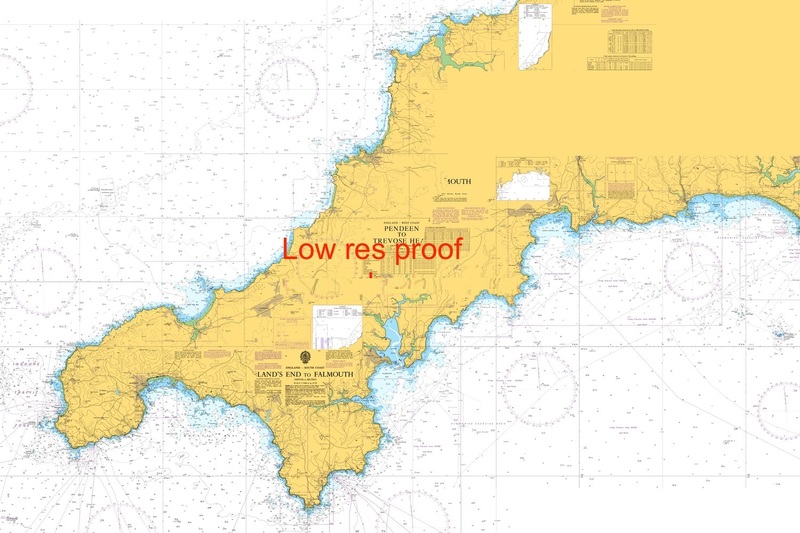 19 March 2015 From Steve Jones in Dorset whose Imray chart was rather crumpled in transit. Hi Guys, Just received a replacement chart this am, in perfect condition! Thank you very much, a very kind and much appreciated gesture. 17 March 2015 From Richard Sparrow in Kent who ordered a Navionics Platinum Plus chart yesterday for his Raymarine e95 Hybrid Touch Multifunction Display. Dear Andy Many thanks your email, just before opening it I saw Christopher's saying he had received the Navionics delivery, very impressive service. I have opened an account as I intend to visit your site before buying anything nautical. Good morning Mike, Just a quick message to let you know that the first three "Top Tips To Start The Season" articles have been converted to PDF and the last two are due to go up on the site later today. You can find the links and PDF versions here. I hope you continue to find them useful. If you have any problems or questions please do not hesitate to contact me. Thanks again for your feedback and suggestions. 05/03/2015 From Nicky Hankinson who had our man polish her topsides with the Shurhold polisher. 02/03/15 from Tamara Hill-Norton in London who ordered a Chart Art print of the Chichester Harbour part of Langstone and Chichester Harbours for her husband's birthday. He loved it - thank you! 19-02-15 From Steve Thornley in Colwyn Bay who ordered a Prop Protector Ropecutter. It has just arrived this morning. Thanks for the very prompt service. 11/02/2015 From Maggie and Ian Grant, somewhere in the Med. It's great to have a chandler who offers good advice. Thank you very much indeed. 03/02/2015 From Christopher Gregg who visited our shop this morning. Comment: Ordered Garmin 451 yesterday, delivered this morning (excellent service from interlink). 11/12/2014 From Derek Read in Derbyshire who ordered a set of Waterline Leather Spreader Boots for Chafe protection. Thank you for your email - I appreciate being kept informed on the progress of my order. I too thought the postage was on the high side but am impressed at the trouble you have taken on my behalf to refund the 2GBP for me. You have just risen to the top of my bookmarked list of chandlers. Thank you. Just a quick note to say I'm very pleased with the new mainsail you made. I've not had the dubious pleasure of sailing hard on the wind with a double reef - yet - but we came back from Edinburgh in August (on the back end of hurricane Bertha) with a double reef and the sail shape looked good to me (sorry no photos). 02/10/2014 From Tom O'Donnell in the west of France who ordered two charts of the Channel Islands and a Tidal Stream Atlas. Hi, Thanks - orders received. Excellent service - thank you. Hi Andy, Thanks ever so much. Somehow you managed to get both the Mega light (an excellent product) and the toilet seat hinges to me before Friday lunchtime so we were able to show our new anchor light and avoid things falling into the toilet over the bank holiday weekend – fantastic. 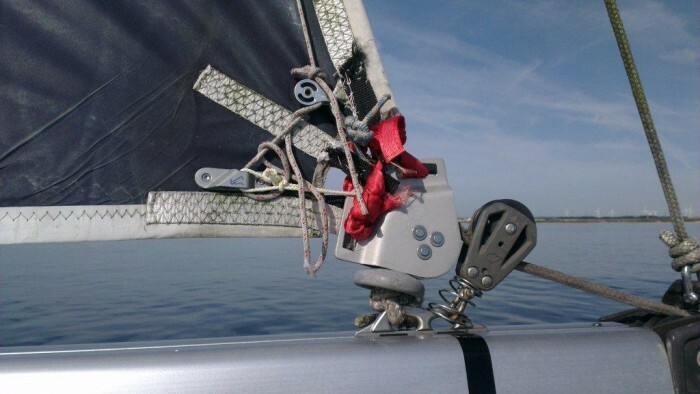 07/08/2014 From Karin Duimel, a visiting Dutch sailor, whose mainsail clew attachment had suffered UV damage. We collected it, did a full repair and delivered it back to the marina the same day. Dear Rob, We had a perfect sailing day! The main sail was doing fine again. Thanks for helping us so quickly!! 05/07/2014 From Brian Robertson in Aberdeen who ordered an Admiralty Leisure Chart Folio. Goods arrived. Excellent service as always! 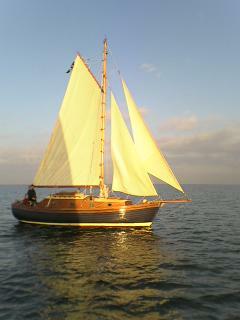 23/06/2014 From the Grants, cruising in Greece who bought some mosquito nets for their hatches. 09/05/2014 From Jeroen in Holland who bought a pir of Musto Evolution Performance Trousers. Hey Andy, The trousers just arrived. Thanks for your reply and fast service! 01/05/2014 From Anatoly in Paris who bought first Musto then Henri Lloyd boots. 23/04/14 From Bruce Burman, Exmouth. We inadvertently shipped him some polysulphide sealant that was past it's shelf life - oops, not our usual practice! Hi Andy, I am most grateful for the refund. It is a pleasure to deal with an organization that takes customer relations seriously. I will have no hesitation in doing business with you again and indeed recommending you to our fellow sailors. 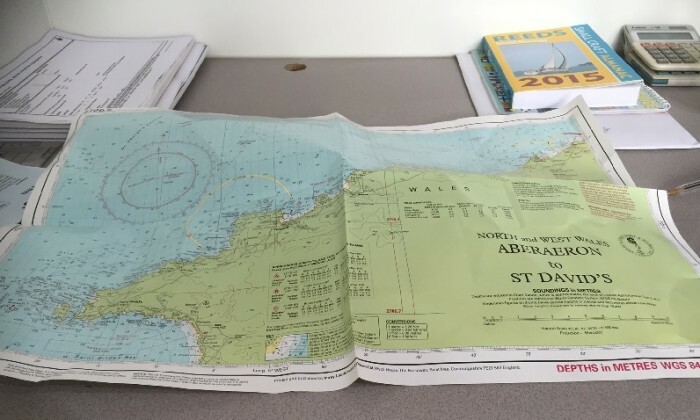 ------------------------------------------------------------------------------------------------------------------------------------------- 01/04/2014 From John Lindley in Sunderland who bought an Admiralty chart. Thank you for a pleasant fast and efficient service. 10/02/2014 From Kilifi Boatyard, Kenya. They ordered a Sta-Lok fitting last Wednesday which was delivered to Holland Thursday morning so that René Faber could hand carry it back to Kenya. I am back in Kilifi, with the Sta-lok fitting! Well done and thank you. Many thanks, good service and competitive price. Will look at your site for future purchases. 18/12/2013 From Dave Parkinson who needed a sail repair for his Dart 18. Been meaning to get round to this for ages, just wanted to say thanks to you and your team for the repairs to my sail, looks great ! 06/11/2013 From James who bought some Universal Stone and Teak Wonder. 16/10/2013 From Andrew Smith in Glasgow who found his Musto Snug wasn't snug enough. Hi Andy The XL jacket arrived today. A perfect fit! Thank you very much indeed for your assistance and for such a quick delivery. 11/10/2013 Tested your rigging out for the first time today Robbie. She was sailing well! Thanks for your help. 30/09/2013 From Paul in Lancashire who needed a green tinted Gebo portlight to match his Jeanneau, and had rather a long wait for it over the holiday period. Thanks Andy, Portlight arrived safe in Spain and is now fitted – we are thrilled with the result. Paul Ross ------------------------------------------------------------------------------------------------------------------------------------------- 30/09/2013 From Chris in Galle, Sri Lanka who ordered some Anti-piracy and Maritime Security charts. Good Morning, Charts received this morning in good order. Thank You. Chris Bell. Country Manager - Sri Lanka Gulf of Aden Group Transits Ltd. ------------------------------------------------------------------------------------------------------------------------------------------- 27/09/2013 Lis Robinson from Hampshire ordered an Optimum Time watch on Tuesday. 20/09/2013 From Bill Stone in Oxfordshire who bought a couple of CTEK battery chargers. Please pass on much thanks to Claire for the great service last weekend in delivering us a new standard horizon handheld VHF after dropping mine whilst in lumpy seas. 16/09/2013 From Simon Band in Hexham, replacing a hinge on his toilet. Thanks Andy I am so impressed at how efficient your site is. I think just post it to me for now, not too sure when I will come over to you, will bring that dinghy when I do. Thanks for very speedy delivery of deck shoes - perfect condition as well. Will always get my Orca Bays from you! 28/08/2013 from Clifford Martin, Martin Engineering Supplies Ltd., Ballymena who ordered a Whale pump service kit on 27th. No problem, it's been great dealing with you, will stop by again next time I need some kit. The package arrived! It is great! Thank you! Hi Storrar Marine, Just a quick line to say thanks for your fast & efficient service on Saturday morning. Our new fridge pump was identified & delivered to the sail training ketch 'Faramir' within half an hour...enabling us to fit it & have working fridges before locking out with our charter party. 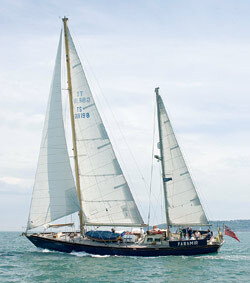 Thanks again for the great service, Dawn Franklyn, Skipper of Faramir, The Cirdan Sailing Trust. 27/06/2013 From Sally Hudson on the Welsh Border who purchased a Jabsco Toilet Fresh kit that could not be installed and had to be returned. Thank you very much for your excellent customer service. We will certainly bear you in mind when we need further bits for our boat. 21/06/2013 From Cathy Wang in Reunion who had difficulty getting a replacement part for her Babynova washing machine. Your belated news letter which is as usual interesting, it reminded me to thank Rob for a job well done. Picture the scene, I'd been lucky to bid on 5 rigging screws that was advertised as perfect for sailing on ebay and was very pleased to get them for £25:00 the screws were larger than the old ones that I had fitted as the bottom of the old rigging screws had bent under strain, so the standing rigging had to be shortened. When I phoned yourselves to get a price I was told to bring the rigging into the shop and you could see what was required and give an a fair estimate. This I did and as luck would have it Rob was available to discuss the matter. On inspection I gave him the new shiny large screws which would be fitted, his face said it all ....... "These are not for sailing but more for a wire fence!" he said, he quickly shot off and came back with the real I am of rigging screws. "This is what you should be putting on." I looked in disbelief I really could see the difference, but at £65 to £70 each it was out of the question purchasing 5 of those. I was starting to go white as the blood drained from my face, as I explained my disappointment to him and why I needed bigger rigging screws. "No you don't, I've an idea" he said as off he went into the stores. Ten minutes later he returned to the shop front armed with several "half" rigging screws ( The bits that were bent) with a crafty universal joint on one end. All my old rigging screws were up onto the desk and he proceeded to mix and match to make 5 perfectly good screws which cost me a very small amount, magic done !! 01/06/2013 From Trevor Pegg in Tamworth who encountered a problem with a Whale service kit: Hi Andy Ref Whale Service repair Kit. I have fitted the kit and it appears to work fine - no leaks!! And the pump is much quieter. It would appear that my engineer had the same problem as you in that un-wittingly he could not get it to tighten up either. Thank you so much for your help. Marine Chandlery is a gem of a find. Having had problem with a water pump and service kit, nothing was too much trouble to resolve the issue. Everyone is most helpful and informative and will go out of their way to help. I will certainly use them again and have no hesitation in recommending them. A real pleasure to deal with! 16/04/2013 From Jason Clark in Italy. Hi. Many thanks for a superb service, received the map less than 24 hrs after ordering!!! Will definitely recommend to friends. Many thanks for your prompt service. The Lavac kit arrived today and I am delighted with it. 13/01/2013 from Mike Riches in Kent: Thanks for an excellent service. Last week I ordered a C-Map chart update and received it back in the same week. Throughout, your staff advice was helpful, and the order was trackable on-line, even down to the hour "window" it was delivered. Powered up without problem and all seems well. 17/12/2012 from Juraj Neuwirth in Prague, Czech Republic, who ordered an Icom M91D Handheld DSC VHF and a SPOT2 Satellite Tracker. Thank you very much for the refund and for your persistance in chasing it up! Thanks also for keeping me informed at every step of the way. The next time I buy a chart (and there will definately be a next time!) I will certainly use your company. Simply amaaaazing. Shows how much I look under the covers! It’s already on your hatch! Only need two clips (in post tonite) to attach to the elastic for you to tension/fit. Though you can leave the cover/invoice with the Marina if it's easier as I'm in there two or three times a week. Rob, Thank you - and Andy - for your precious help. Hope to have soon another opportunity to make business again. Thank you for sourcing and delivering my order for Dubarry deckshoes, which arrived on time today, exactly as scheduled. You have set a new standard for me in helpfulness and efficiency, and all at a competitive price. The shoes fit, have no scuffing or other defect, and are exactly as wanted. Good afternoon, just a quick email to say thank you for the great service, my order arrived as time stated and all correct. Would recommend your services. After the hiatus of getting that rigging out of your hands, I just wanted to tell you that we have received the pallet safely. The rigging is assembled, the mast is up and secure. Your work is really appreciated. Have posted faulty light back. Replacement one arrived this morning and it works. Delivery of an Optimum Time Jumbo watch - here's hoping it brings good results! Just arrived Rob thank you. Cheers, that would be six wins if I did but fear my run of good luck will end shortly! Hi, Posted first class yesterday, make sure you win! Dear Rob, How are we doing with the start watch I ordered, Racing Sunday! Dear Andy, I regret that all too often we forget to commend people for their extremely good service. We have received our urgent rope shipment from you in very good time and all is well. Thank you very much for organising the replacement of the Orca Bay shoes, it is very much appreciated. Having had an email from Rob Storrar with the very kind offer of keeping the shoes along with a refund; I declined the offer and returned the shoes to Orca Bay as discussed. I had a telephone call from Orca Bay to confirm receipt and despatch of the replacement shoes of which I received the following day. I am extremely impressed by the standard of service, the efficiency and helpfulness I received from Marine Chandlery and Orca Bay. Thank you for restoring my faith in customer service, it’s very reassuring to know that excellent service still exists. Many thanks again and long may such excellent service continue. From Suze Watling in Surrey who needed some boots she could not find elsewhere. Andy, just to say a big thank you - my Musto boots arrived yesterday at the exact time the couriers had said & they fit perfectly. Andy That is brilliant - thank you! The stuff has arrived already - can do the full winterisation tomorrow. From Dougie MacDonald who needed something he ordered on Friday for a Saturday delivery. Thanks very much for your excellent service, I was worried it wouldn't arrive before we were launching, the fact that it did and that you also refunded me (the excess delivery charge), is a very rare quality of service. You have to be congratulated on the way your business is run. From Mike Stemmer who ordered an O'Neill vest. Hello, Order # 8040 was received ok this morning. From David Wood who ordered a Rutland 503. Thanks a million for your good services. I ordered a wind turbine on Wednesday (was actually on the Thursday) - and you delivered it on Friday. The packaging was very thorough - it took a lot of initiative and time to open it. From Angus Nairn of Rib Rescue in Weymouth who ordered a replacement battery for an ICOM handheld VHF. Received today, many thanks for a brilliantly quick service, much appreciated. From David Wolf in West Sussex who ordered a pair or Orca Bay shoes. Great quality, great price and wonderful service!! From Sharron England in Preston, Lancs, who ordered a Rutland Regulator overnight. From David Heritage Racing Yachts in Cowes, who needed a Tacktick wind transmitter in a hurry. Hi, Thank you! You have really saved our skin over here and we really appreciate it. Today I have received the order in perfect condition. Thanks for the service, it will guarantee a safe crossing to the UK this summer. Great Service !!!! I ordered a Rocna anchor 2 days ago, and today it came here to me in Denmark.....I never seen better service....Thanks. This is not an 'advert' for Storrar Marine but I do want to put on record my deep appreciation of the help that we have had from Rob, Andy and everyone else in preparing Reveller for our trip. We first visited Storrars in our early days of sailing as raw novices knowing very little and over the few short years that we have been sailing Rob and Andy have been an ever reliable source of help and good advice. This was often unconnected to a sale and sometimes even to their detriment when they said "You don't need it" of something we felt we should add to our equipment. On our journey so far we have called in at several chandlers and they have made us realise how good Storrars are in the service they provide not only in the range of items that they stock but also in the knowledgeable advice available. Use it or lose it. Give them a visit - you won't regret it. Ok - maybe it did turn into an advert - but I also feel that it's good advice. 'Nuff said. The winch handles are gorgeous! We made three guns and second overall in the spring series at Hebe Haven HK and I manged a few extra inches on the halyards with them, made all the difference. From Rod Bain in Edinburgh who needed some deck shoes and a pair of boots urgently. Hi Andy, Just to say thanks for very quick service; the package arrived promptly on Friday morning. Perfect. Good afternoon. Our order arrived early this morning and Tony wanted to let you know how impressed he was with your quick service and good packaging. A pat on the back for all involved, thanks. From Geoff Hilditch in the Wirral, a Rocna customer. The anchor just arrived by Interlink – very impressed with the service from you and them! Thank you for your efforts. I have the rods, but I agree with David Lawson about replacing them and the rings as well and so look forward to receiving them in due course. I do need the balls though, Shirley thinks that this is hilarious!, as quickly as possible. Once everything is in place we should have the Genoa pirouetting like a ballerina! On a serious note, many thanks for your very prompt action. If you are looking for a customer satisfaction quote, I would give it without reservation. Sir, I have just received goods from you less than 24hour from placing the order, well packed and in excellent order “excellent service” thank you. I am really pleased to tell you my new (gorgeous) shoes arrived a few minutes ago!!! Hi Andy, the stuffs arrived today and everything is perfect. great. many thanks and see you at the next purchase. From Michael Drekker in Germany, who received a faulty pair of Dubarry shoes. If I send the box back to Dubarry, I will also send a brief description why I send the shoes back. You will also get the receipt by mail or as a copy. Best regards and thank you for your support. It is really a very good service which is not often in these times. Many thanks for locating the Musto jacket for me. Just wanted to say I am very impressed with the level of service you have provided. Hi Robbie, received my parcel this morning .great service.many thanks . Hi, Cradle arrived this morning. Best price I could find on the net and fast delivery! Hello. Thank you for the two pairs of Orca deck shoes I recently ordered.They arrived at 8:30 this morning. Brilliant service !! Just to let you know that my Musto package arrived this afternoon. All the clothes fit perfectly and I am very pleased with them. Thanks for enclosing a cap with the Musto gear, it was a pleasant surprise and will be very useful. Thanks also for letting me know about the delivery problems you were experiencing, it was really appreciated. 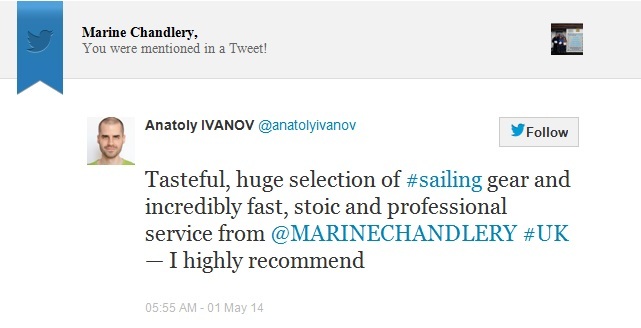 I will definitely use Marine Chandlery in the future and recommend you to my friends. Just a quick email to thank you Guys for an unbelievably quick turnaround on the anti-freeze (especially considering the weather conditions up and down the country)…it arrived about half an hour ago which makes it pretty much 24 hours on the dot from the confirmed order. Thanks again, very impressive….and just in time this end! From Mario Špehar who ordered a Henri Lloyd Diablo jacket for delivery to Slovenia. The jacket was delivered today. Thank you a lot for the assistance, will shop again here! From Patricia Barclay who ordered a Musto bag. Just to say that the bag arrived yesterday and I've got a very happy birthday boy here today!! Thank you so much for all your help. From Ron Hancock who ordered a Lewmar Portlight he planned to take overseas. Hi Many thanks for fast delivery item arrived yesterday, excellent service. From Anna Mitchell who ordered a toilet for delivery to Italy. Thanks very much for prompt service. I look forward to receiving it - and no more blushes! I will recommend you to friends and use you again. From Robert Darby who recently purchased a Relief Band from us. The band definitely works. After a short trip from Newcastle to Sunderland I was miserably sick! We decided to order a band. We then sailed Sunderland – Hartlepool – Whitby – Hartlepool without any sickness. Remarkable! Well, Storrars have done it again. This is just to let you know we are extremely satisfied with our new Smartwave 2400 which you recommended. The build quality is superb and I'm sure it will last for many a year without any more pumping it up!!! The colour looks great against the stainless steel davits and we have fitted it so that it attaches to the davits and raises and lowers without any problems. We fitted a large pad eye at the front and reinforced underneath the front section with 3/4 marine ply after installing an inspection hatch. The rear end was no problem . We just fitted once again 2 pad eyes to the rear transom. I'm absolutely over the moon and thank you for your good recommendation and service. My very best regards to you all. Where would we be without a good Chandlers?????? probably well off! on board 'Tinkerbelle' Vibo Valentia, Italy. From Philip Aspey, ‘Shahrazad’, Port Napoleon, West Provence, France. Andy, at Storrar Marine, sorted out all the parts I needed for my (Mercruiser) outdrive legs and sent them to me in the South of France by guaranteed next day delivery. The French engineer told me that the engine parts I needed were no longer available. Andy tracked them down for me and saved me hundreds of pounds. 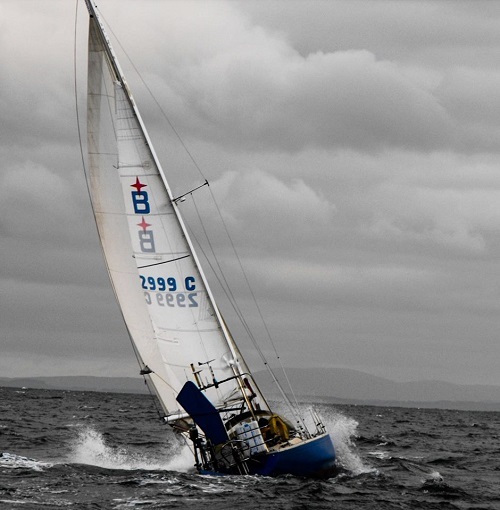 We have used Storrar Marine for many years both as dinghy racers for our spares and equipment and also when refitting our yacht to embark on a 16,500 mile trip to Australia. The service is always second to none, these guys really know their stuff and give honest and impartial advice. We shopped around for many of our items, Storrar Marine was usually the most competitive on price. We sourced most of our equipment through Storrar Marine, from EPIRBs to Windlasses and sail repairs. The team are excellent at after sales service, helping replace or repair items under warranty for us by liaising with the manufacturers on our behalf. They even sent spare parts to the Canary Islands for us! I could not recommend the team highly enough - I just wish they had a branch in Sydney! From leaving the West coast of Scotland five years ago and heading into the Mediterranean, one of the most important back ups was to have a sound and reliable Chandler supplier. There has been many times from far afield we have contacted Robbie, Andy and gang and always found them most obliging and their technical advice surpassing local sources. This has given us the assurance to take on many challenges and with good partners like them the horizons are not a problem. As well as sound advice they have supplied us with the smallest of items to the largest of items, at a good price, a speedy delivery and never let us down once, even when we were desperate for a new fridge. From drawings a new canopy and sun awning were sent out to Italy and the quality was superb and the fitting was spot on. Mind you its cost me several boxes of chocolate biscuits to keep them sweet.!!!! I have no doubt that across the Mediterranian and even the world's sea highways Storrars are known. Congratulations to all. Its all true and all from the heart!!!! Keep it up. A Thank-you letter to "Team Storrar"
We were recommended to come to Storrar Marine many years ago to have a third reef put in a sail for our newly acquired first boat. Then a working jib was made which proved far more efficient than a reefed genoa... we have returned to you again and again for everything from a shackle through single line reefing system to winches and wind generators and electronics. Now on our third boat fitting out we realise why. Why Storrar Marine? We usually get exactly what we want, and if we ask for something that is inappropriate we get expert advice and are pointed in the right direction. "After-care", (customer service) and attention to detail are top-notch and save us hundreds of pounds and hours of frustration. So for those who say "I can get it cheaper on Ebay", THINK AGAIN, the SERVICE is PRICELESS at STORRARS.